IBS, irritable bowel syndrome, affects tens of millions of people in the U.S. alone. Each person suffers a different set of symptoms, but will commonly have bowel changes including one or more of diarrhea, constipation, and frequent urge to use the bathroom. In addition to bowel changes, people suffering from IBS can have a wide range of symptoms including gas, bloating, stomach pain, indigestion and mucus in their stool. Symptoms can range from mild discomfort to debilitation. The causes of IBS aren’t fully known, hence it’s called a “syndrome”. It can be complicated and different from person to person. While the cause of IBS is not exactly known, there seems to be a strong correlation with stress and anxiety and therefore is likely due, at least in part, to signaling between the gut and the brain. Food sensitivities are caused by foods you either have difficulty digesting or that create a delayed immune reaction. They cause gastrointestinal inflammation that often results in IBS symptoms, not to mention fatigue, joint pain, headaches, brain fog, and more. Many people have these sensitivities without knowing it, yet they are at the core of many common ailments. 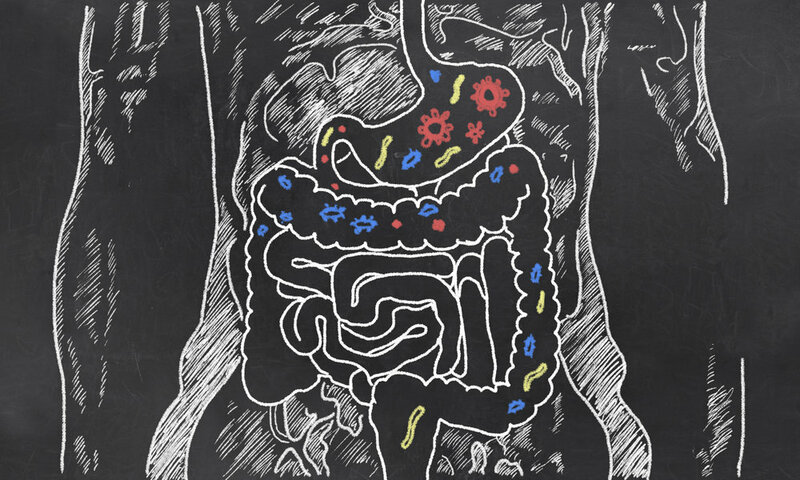 Your large intestine has an enormous amount of microbes that work to aid in digestion and immunity. Unfortunately, everyday modern life takes its toll on these healthy inhabitants. Pharmaceuticals (especially antibiotics and acid blockers), environmental toxins, inflammatory foods, and stress can greatly impact the health of your microbiome resulting in IBS symptoms. Microbial infections can cause dysbiosis and inflammation, leading you to suffer from IBS symptoms. SIBO/SIFO (Small Intestinal Bacterial/Fungal Overgrowth) are two difficult and common forms of infections. Both occur when microbes relocate from the large intestine to the small intestine where they cause bloating, fullness, gas, and other IBS symptoms. Proper functioning of your digestive tract requires a synchronized flow of stomach acid, enzymes, and muscular contractions. Alterations in any of these can reduce your ability to digest foods properly leading to constipation, diarrhea, gas and other IBS symptoms. #1-4 above can all cause leaky gut which allow poorly digested foods, microbes, and toxins direct access to your blood stream. Your immune system doesn’t like this and will react leading to inflammation and IBS symptoms. If that’s all that happens, count yourself lucky! A leaky gut can also lead to more serious autoimmune diseases like Rheumatoid Arthritis, Hashimoto’s Thyroiditis, and Multiple Sclerosis. Changing your diet can be challenging but is well worth the investment. A FODMAP diet or elimination diet can be life changing. These diets can be tricky to navigate on your own so you may want to consider consulting with your Naturopathic Doctor to figure out which one might be the best fit for you. Bone broth is soothing and healing to the lining of the digestive tract. This is something I use frequently in my practice for IBS, but I don’t’ stop there. It’s great for any illness that stems from or includes the gut, like autoimmune diseases. You can cook with it, drink it, or even do a bone broth “fast”. Try to always use organic chicken or grass-fed beef bone broth. Probiotic supplements and fermented foods such as yogurt, sauerkraut, kimchi, kefir, and kombucha will support a healthy microbiome and can help with IBS symptoms. The one caveat, both can be aggravating for you if you have SIBO. Herbal remedies such as turmeric, are anti-inflammatory, antioxidant and anti-cancer. Herbal remedies can either be taken as supplements or in many instances be incorporated into your diet. For example, you can use turmeric in curries, golden milk, and other recipes (see our golden milk recipe). If you’re managing an illness or symptoms you will find better results by using a supplement. Stress and anxiety are strongly correlated to IBS. A daily meditation or prayer practice that you enjoy and will do on a daily basis may reduce your symptoms due to their ability to reduce stress. If you prefer a guided meditation, there are many options online - many of my clients like to use Headspace. Move your body! Exercise can help with constipation, stress, anxiety, and overall well-being. Find an exercise that is sustainable for you - it can be anything you enjoy such as walking, dancing, yoga and beyond. Finding a partner who will keep you accountable can make a substantial difference for those who lose interest easily. We have so many tools and tips to help with the symptoms of IBS and other digestive tract disorders. But, tools and tips are just the beginning. We can help you understand and avoid your triggers and uncover the cause of your illness using detailed history taking and functional lab testing. Don’t accept your IBS symptoms as a way of life. No doubt, navigating IBS can be tricky, but these symptoms can be reduced or eliminated. If you are suffering from IBS, schedule a free 15-minute consult with me to find out ways that I can help you take control of your health and feel great.